The Dragon Bluetooth wireless headset is specifically designed to meet Nuance's highest performance and quality standards for the most optimized and highest level of accuracy when using Dragon speech recognition products. 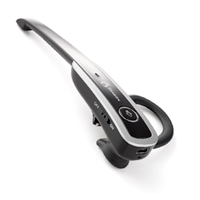 This Bluetooth headset will allow you to wirelessly dictate to your computer while enabling you to maintain a consistent distance between your mouth and the microphone. 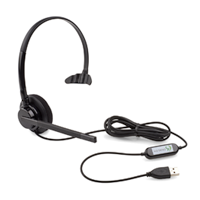 The Dragon USB headset delivers superior audio input for use with Dragon NaturallySpeaking. A noise-cancelling microphone enhances speech accuracy while the USB-enhanced digital sound ensures consistent audio quality every time. The adjustable single earphone design fits left- or right-side and lets you tune in to your PC while remaining in touch with your surroundings. 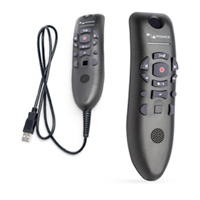 Nuance PowerMic III microphone offers simplified, thumb-control operation for dictating, navigating, reviewing and editing of speech recognition generated documentation with Microsoft® compatible PC mouse capabilities. © 2002 - 2019 Nuance Communications, Inc. All rights reserved.